Every day our team talks with people that tell us they want to start using digital X-ray but that they need to go digital at or below a certain price point. The good news for all of these people is that there is more than one way to go digital, and each method can accommodate a different price point as well as meet a different set of needs. From CR machines, to flat panel detectors, take a look at the digital X-ray options below to begin building an idea of what might be the best fit for your facility's next solution. Want to try a flat panel digital detector in your own facility? Click here to schedule a free on-site demo! If you operate outside the US, the lowest capital expense for taking your analog X-ray system digital is to purchase a CR machine to go with it. You take your shots on a specialized CR cassette, feed it through your CR, and voila - you have a digital image. The up-front cost of CR can be minimized even further if you take advantage of the wide availability of used systems. CR is also much faster and more cost-effective than film processing. It is, however, the least time-efficient method of going digital due to the time it takes to transport and scan the cassettes. If you are at a US-based facility, be aware that, beginning in 2018, studies processed with a CR machine will be subject to a 7% reimbursement cut. Because of these cuts, we strongly encourage US equipment buyers to consider other options for going digital. 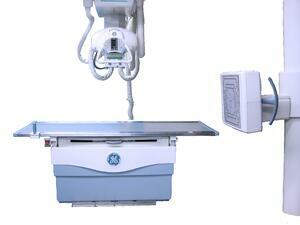 On the other end of the spectrum is a factory-born digital radiography (DR) unit. These are, by far, the most expensive way to go digital. They offer big advantages over CR in terms of image processing times. There are no cassettes involved and the time between image acquisition and digital rendering on the workstation is a matter of seconds. There can also be an appreciable image quality benefit in using a fully digital room as opposed to an analog room with a CR. I mage quality and acquisition time are comparable between factory DR systems and analog systems retrofitted with DR panels (option 3). 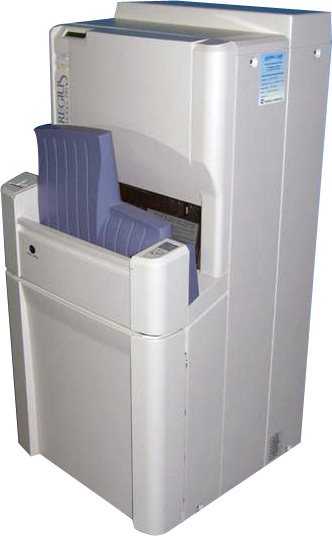 The primary advantage a factory system holds over a retrofit is that many models feature automated movements that can further streamline the overall efficiency of an X-ray room in moving patients through as expeditiously as possible.This option is generally only cost-effective for facilities with rather high patient volume. In our experience working with X-ray buyers from a variety of needs and budgets, this option is, more often than not, the most cost-effective. 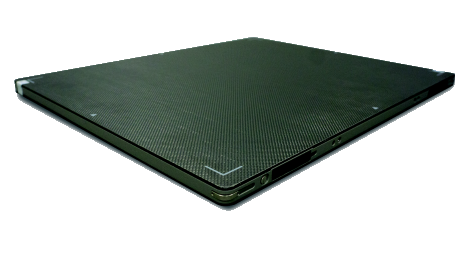 DR flat panel detectors work with any X-ray system and, like a factory DR sytem, they eliminate cassettes, improve image quality, and acquire and render images in seconds. Like a CR reader, they allow you to continue using your existing X-ray room without the need to remove large pieces of equipment or remodel your room. Fixed Detectors: The detector is installed into the chest stand of the existing system. An excellent option for chiropractic X-ray rooms or in combination with a second detector in the table tray. A dual-detector setup eliminates the need to swap the detector between procedures. Tethered Detectors: The detector is movable from the chest stand to the table. It communicates with the workstation through a single cable. This option is a good fit for low-mid volume facilites where moving the detector will be relatively minimal. Wireless Detectors: The detector is powered by a battery and communicates with the workstation wirelessly. It is free to move between chest stand and table and even to be used with a portable X-ray traveling around a facility. Wireless is a good fit for mid-high volume facilities or facilities that frequently use portable X-ray systems. Other than the panel itself (the same size as a cassette) the only new pieces a retrofit kit brings into your space are a computer (desktop or laptop options available), a control box about the size of a wifi router, and - if your panel is wireless - a battery charger. As we mentioned earlier, the automation offered by some factory DR models can bring even more efficiency to the table, but the volume and performance needs of most facilities are well-met at the price point of a DR detector retrofit. Whenever you're ready to upgrade from analog X-ray to digital, you certainly won't be locked into any single option. Whether your needs and budget have you leaning toward a CR, a retrofit, or a full replacement, there is a solution that can take your X-ray capabilities to the next level affordably. If you'd like to start an upgrade conversation today, you can contact our X-ray product specialists to talk the options over, or request a free on-site demo of a DR panel at your facility.